Tens of thousands gathered in Rome on Saturday to protest against a series of austerity measures introduced by Italy's centre-left government. The government says the package of tax rises and spending cuts is needed to reduce Italy's public deficit. 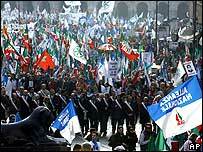 The centre-right opposition have called it an attack on Italy's middle classes. The rally was addressed by opposition leader Silvio Berlusconi who collapsed during a political gathering earlier this week. The former prime minister, who is 70-years-old, blamed stress and lack of sleep for the irregular heart beat which his doctors said he had been suffering from. 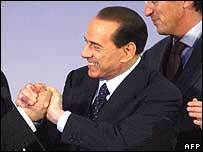 Mr Berlusconi's aides say he spent his time in hospital writing what they dubbed a comeback speech. The BBC's Mark Duff says that Mr Berlusconi had promised an extraordinary demonstration and his supporters came from far and wide to fulfil that pledge. Police said about 80,000 opposition supporters had joined the demonstration, which centred on Saint Giovanni square in Rome, where a stage bearing a banner reading "For freedom, against the regime" had been erected. Our correspondent said Mr Berlusconi looked well as he urged his followers to defeat a government, which he said was destroying the wealth and freedom of all Italians. "We want to send packing this government, which destroys citizens' trust in the state, wastes resources and limits everyone's freedom," Mr Berlusconi told the crowd. "We are here to prevent the left from impoverishing Italy morally and materially," he added. Some of the protesters carried placards saying "Thank God there are no communists in my family" or bearing a likeness of Pinocchio denouncing Prime Minister Romano Prodi's "lies". Apart from supporters of Mr Berlusconi's own party, two other members of his centre-right coalition were taking party - the regionalist Northern League, and the former Fascists of the National Alliance.